The audience is different at a matinee of a show advertised as suitable for families. There are a lot more black velvet dresses and pink snow boots. I overheard a discussion beforehand about how live theatre is different from movies, with an adult explaining that no, it’s not all going to be on that little screen, and I overheard a discussion afterwards with other audience members saying that they didn’t want to go home yet, they wanted to stay and talk to the characters. It was also clear to me that some young members of the audience were restless during the long poems and songs, and they didn’t conceal that quite as effectively as I like to think that I do nowadays. All that being said, I did not find any of the audience members badly behaved or disruptive of my enjoyment of the show. And I did enjoy it. Lewis Carroll’s story Alice Through the Looking Glass, written in 1873, was adapted for the stage by Jim DeFelice in 1974, with music written by Larry Reese. The production currently playing at the Red Deer College Arts Centre Mainstage is directed by faculty member Lynda Adams, and the seven performers are all final year students in Theatre Performance and Creation. Julia Van Dam played the eponymous Alice convincingly as an imaginative Victorian-era child of “seven years and six months”, daydreaming of imaginary worlds and then landing in an unexpected one where things don’t go the way she dreamed. Her body language, more expressive than an adult’s but still restricted by custom and crinoline, conveys delight, responsibility, frustration, and relief, and her singing voice is up to the material while not seeming inappropriately adult. The other six cast members all played multiple characters. The story was simplified a little bit from the original, but they left in all the important characters – TweedleDum and TweedleDee (Jennifer Suter and Jessie Muir), Humpty Dumpty (Dustin Funk), and some of the chess pieces. As in the original, and in the playing-card symbolism of Alice In Wonderland, it was interesting to see the chess pieces develop distinctive character traits – the Red King (Dustin Funk) is sleepy to the point of narcolepsy, the Red Queen (Jessica Bordley) is a stern parent/teacher figure hectoring Alice about manners and behaviour while the White Queen (Collette Radau) is endearingly gentle and bewildered, and the White King (Jake Tkaczyk) is forgetful and clumsy. Except for the Red Queen and to some extent Humpty Dumpty, all the characters treat Alice as an adult with agency, and she readily takes on responsibilities of taking care of herself and of them. This was satisfying to me as a child reader and was still so as an adult playgoer watching the story through her eyes. I noticed other ways that my old reactions to the story coloured my responses to the play. I started out scared of the Red Queen, but I think actually that came from being scared of the playing-card characters in Alice in Wonderland. I thought the Walrus and Carpenter song was both too long and too disturbing, because that is how I felt about it when I first read it. In this stage production, I really enjoyed the oysters-as-puppets though. And I still felt impatient during Alice’s encounter with the White Knight (Jen Suter) in the penultimate square. As in the book, it felt like an irrelevant delay in order to introduce yet another eccentric character and recite yet another poem. Jen Suter plays the White Knight with a sort of cowboy accent, perhaps of a cowboy whose range extends from Montana to somewhere in the Old South, but her delivery of the repeated line about “it’s my oooown invention” was very funny, and I heard a lot of adult chuckles during that scene. I loved the expressive movement and feathery menace of the Black Crow (Jessica Bordley) just before and just after intermission, as the White King flails around causing or harnessing a tornado with his queen’s long unmanageable shawl. It’s not really a story with a conventional plot arc or a lot of continuity, just Alice’s goal of reaching the eighth row of the chessboard as a pawn so that she can become a queen. One undercurrent of theme is about names and loss of identity, as several characters warn Alice about losing her name or challenge her to replace it. In a pair of framing scenes at the beginning and end, Alice is a little girl in her own house interacting with her nurse (Collette Radau) and her cat Dinah (Jessie Muir, with amusingly-credible feline physicality). The “real” world scenes are shown as silhouette shadows on a scrim, with black and white drawing showing a fireplace, mantelpiece mirror, and chessboard. This created a magical contrast with the colourful three-dimensional Looking-Glass world, similar to the colour film effect in Wizard of Oz, although I did wonder whether it confused the family behind me, in which an adult had just explained that the live actors in the play weren’t going to be on the screen at all. The initial scene also made very clever use of the optical trick of having one character farther from the light than the other, so that Alice standing up looked about the same height as her seated nurse. mirror-frame decoupaged with mirror-image text from the Jabberwock) illuminating a Storyteller (Jake Tkaczyk) in Victorian-period frock coat, top hat, and white gloves and still demeanour, who sings the Prelude song “Child of the pure unclouded brow”. His well-trained mid-range voice would not be out of place in musical theatre and his changes in delivery for different parts of the song helped make sense of the rather abstract lyrical poetry. After the ending scene with real-world Alice on the screen talking over the adventures with her cat, Tkaczyk begins to sing again in costume as the White King but with the Storyteller’s voice, and the curtain rises again on the Looking-Glass world as the other performers join in with the choral finale. Again, this provides a pleasing symmetry while also covering the musical-theatre convention of an all-cast song leading to the curtain calls. The chess-piece costumes were very clever, with wide padded stiff hoops at the rim of robes suspended from the performers’ shoulders. Similar stiff hoops could be spotted at the bottom edges of the knights’ horses, at TweedleDum and TweedleDee’s trouser cuffs, and on various sleeve cuffs. Alice’s costuming, pink white and black with ringlets and a big hairbow, suited the clear simple palette of the show, but drew attention with small patterns and details reminiscent of the little-girl fussiness of the Harajuku Girls (Gwen Stefani’s backup dancers). The fantasy world’s set used a revolve painted with a chessboard grid, and a pile of different-height boxes consistent with the grid. Various trees, flowers, and so on continue the theme of coloured squares. As I had been spending time with a young nephew before the show I was immediately reminded of the video game Minecraft, but that may not have been intentional. The momentary jarring sensation when I heard the phrase “grassy knoll” on the 50th anniversary of J.F. Kennedy’s death was certainly not intentional. The backdrop included a whirling Fibonacci-sequence checkerboard cloud formation. Four stage technicians, students in the Theatre Production program, (Michael Johnson, Jordan Kruithof, Astrid Olivares, Jesse Robbins) contributed visibly to the production, as hands appearing in tables to serve drinks, crew of the Fourth-Square Express train, and especially at discovering Humpty Dumpty after his fall. In the early performances I saw, there was possibly a little bit of sound balancing inconsistency in the first choral number, “Through the Glass”, and a few places where a performer was not speaking clearly enough to be easily heard from the middle of the big auditorium. But those are easy details which will likely be corrected before this week’s performances, running Tuesday through Saturday (Nov 26 through 30), with tickets available through Black Knight Ticket Centre as usual. 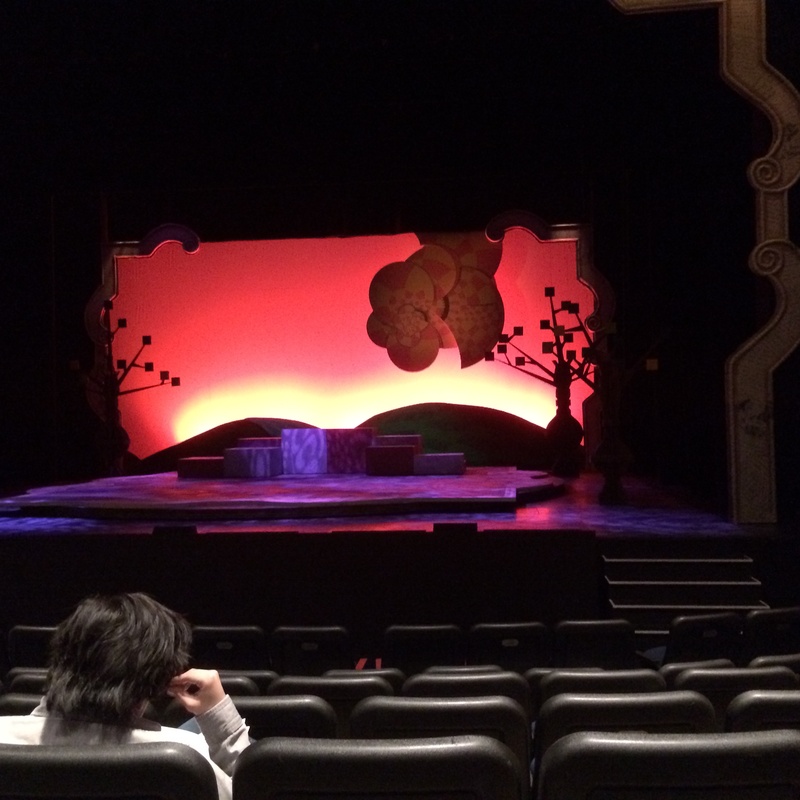 An audience member studies the set for Through the Looking Glass at intermission. This entry was posted in Alberta, Theatre and tagged collette radau, dustin funk, jake tkaczyk, james defelice, jen suter, jessica bordley, jessie muir, julia van dam, larry reese, lynda adams, red deer college on November 24, 2013 by Ephemeral Pleasures.